In 'Munich,' Neville Chamberlain Gets The Best Of Hitler History hasn't been kind to British Prime Minister Neville Chamberlain, who tried to head off war by appeasing Adolf Hitler. But Robert Harris' new novel Munich asks readers to reconsider Chamberlain. 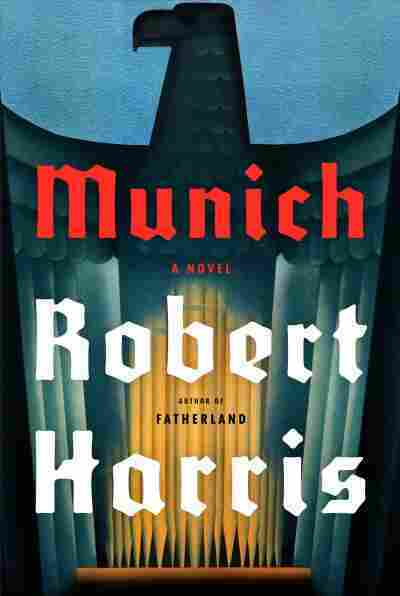 Author Robert Harris' new novel Munich takes us back to 1938, to the days before World War II. Of course, we say now that it was before the war — but back then, people weren't at all sure another war was coming. In September of that year, German leader Adolf Hitler demanded parts of neighboring Czechoslovakia. He threatened to invade, but at a meeting in Munich, British Prime Minister Neville Chamberlain negotiated what he famously called "peace for our time." History was not kind to Chamberlain. He allowed Hitler to dismember Czechoslovakia, and in the end he only delayed the war, since Hitler kept seizing territory. But Harris wants us to rethink those talks between Hitler and Chamberlain. "You couldn't get two figures in history more unalike," he says, "and yet, contrary to popular myth, I think it's Chamberlain that got the better of Hitler at Munich. Hitler did not want to be there. He wanted to be at the head of his army advancing on Prague." Harris is a journalist as well as a novelist, and his historical fiction often seems to comment on current events. This latest book tells the story of September 1938 through two young men at the Munich negotiations. One is a low-level German official; the other is a British aide to Chamberlain. Both are trying to find a way to do right in a time of rising fascism, and we see their leaders through their eyes. The British had lost three quarters of a million men only 20 years before, in the First World War, and you've got to think yourself back, to how that felt. And we were still re-arming in Britain, it was to be another couple of years before we had a sufficient air force to take on the Germans. We only had 20 operational Spitfires in September 1938. We were armed with biplanes. So, you know, this was the backdrop to the novel. The best witness for my view, which I admit challenges the popular conception, the best witness is Adolf Hitler, and one of the reasons I wanted to write the novel was I came across a diary written by Joachim Fest, the German historian, who ghost-wrote Albert Speer's memoirs — Speer was Hitler's armaments minister. And he asked Speer about Munich, and Speer said Hitler was in a foul mood for weeks after Munich, and at a dinner party it all came pouring out. He said, the German people have been duped, and by Chamberlain of all people. And even at the end of his life in 1945, Hitler was saying, "We should have gone to war in 1938, September 1938 would have been the perfect time." And I think if the British and the French had gone to war in September 1938, Hitler might well have survived a lot longer and been much more triumphant. I think if the British and the French had gone to war in September 1938, Hitler might well have ... been much more triumphant. Yes, very much so ... I'd been thinking about writing a novel about Munich for 30 years, and it was only in the last year that I found the story, and found the resonance, that it suddenly seemed that this was the right moment at which to embark upon it. And you're right, that for a young man, these two young men, the protagonists of my novel, they're at Oxford in 1930, one English, one German, young men, and yet they are doomed. They are trapped on opposing sides, and there is nothing they feel that they can do about it. That there are forces at work in the world, driving it towards an abyss, and even though a lot of people can clearly see where everything's going, no one seems able to stop it. And I think that there is a sense in the world now that something is going on, and that it's very hard for any of us to stand up against it. And I feel therefore a great deal of empathy with these two young men, who are doomed to fight, and it's like a kind of madness, a sickness that's going to work itself through. Danny Hajek and Shannon Rhoades produced and edited this interview for broadcast. Petra Mayer adapted it for the Web. A previous version of this story misidentified the author as Richard Harris. He is Robert Harris.